Shirts With Random Triangles: USC's 2020 football recruiting class begins with high school junior QB Bryce Young and high school junior WR Kris Hutson. USC's 2020 football recruiting class begins with high school junior QB Bryce Young and high school junior WR Kris Hutson. Bryce Young. Image via Burnt Orange Nation. USC has its first two members of its 2020 football recruiting class. 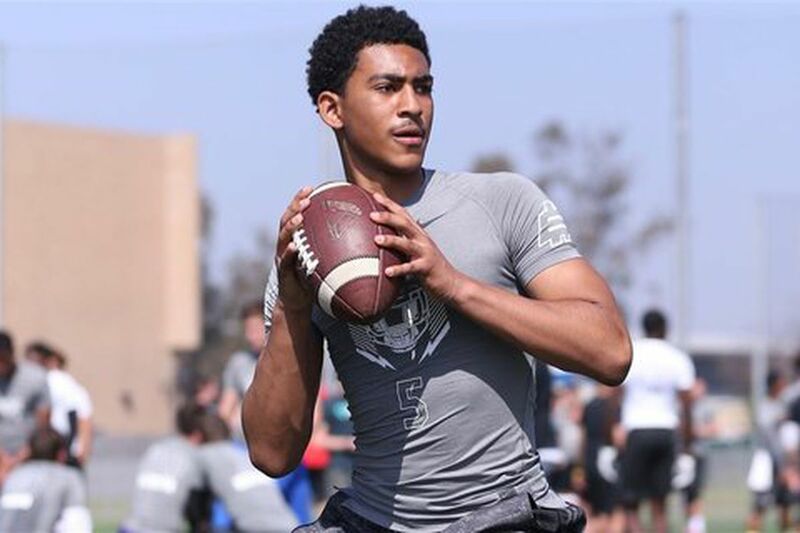 Santa Ana, California rising high school junior quarterback Bryce Young committed to the Trojans on Wednesday, while Bellflower, Ca. rising high school junior wide reciever Kris Hutson announced his commitment on Thursday. 247Sports grades Young as a composite five-star dual-threat quarterback prospect. The recruiting site’s composite prospect rankings for 2020 rank Young at no. 1 among dual-threat QB prospects, at no. 6 among prospects from the state of California, and at no. 24 nationally. Young attends Mater Dei High School in Santa Ana, Ca. He stands 5’11, and weighs 176 lbs. 247Sports grades Hutson as a three-star wide receiver prospect. The recruiting sites prospect rankings for 2020 rank Hutson at no. 68 among WR prospects, at no. 37 among prospects from the state of California, and at no. 334 nationally. Hutson attends St. John Bosco High School in Bellflower, Ca. He stands 5’10, and weighs 170 lbs.